Edit text files, XML, HTML, Unicode and UTF-8 files, C/C++ source code, etc. Unlimited undo and powerful editing and scripting tools. Huge file support (50 GB+). 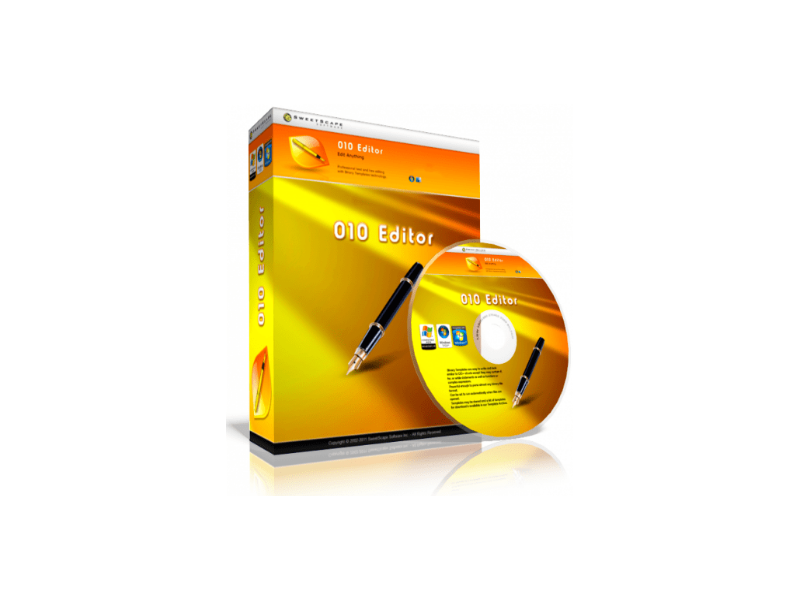 Unequalled binary editing performance for files of any size. Use powerful Binary Templates technology to understand binary data. Find and fix problems with hard drives, memory keys, flash drives, CD-ROMs, etc. Investigate and modify memory from processes. 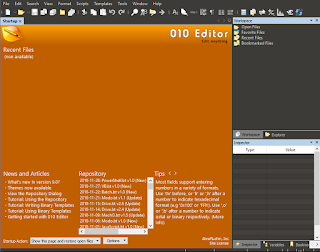 Why is 010 Editor so powerful? 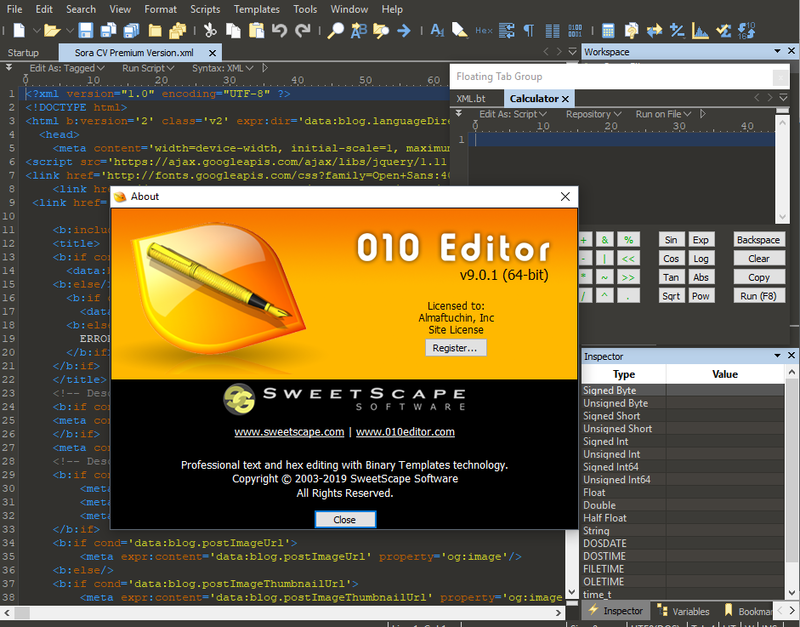 Unlike traditional hex editors which only display the raw hex bytes of a file (1), 010 Editor can also parse a file into a hierarchical structure using a Binary Template (2). The results of running a Binary Template are much easier to understand and edit than using just the raw hex bytes. Binary Templates are easy to write and look similar to C/C++ structs except they may contain if, for, or while statements as well as functions or complex expressions. Powerful enough to parse almost any binary file format. Can be set to run automatically when files are opened. Templates may be shared and a list of templates for download is available in our Template Repository. 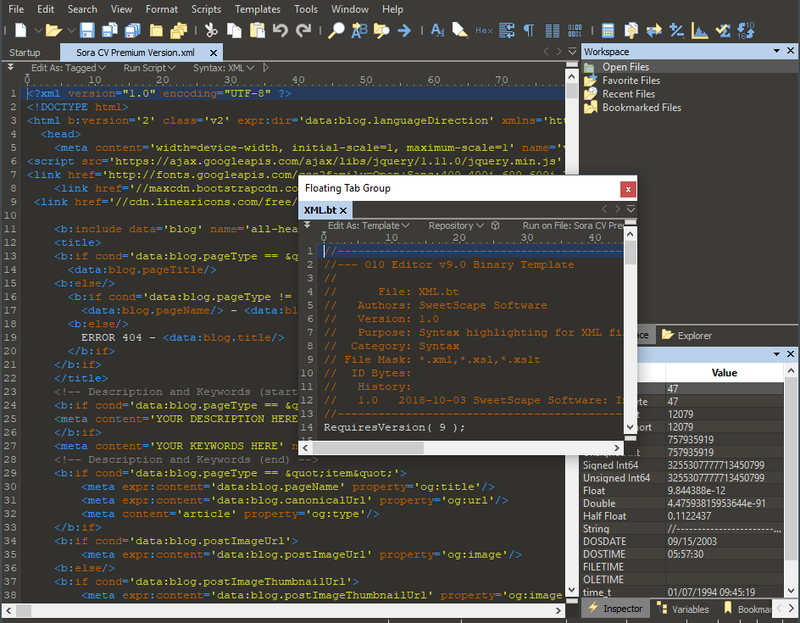 Full Find, Replace, Find in Files, and Replace in Files functionality for many different data types. Powerful Binary Comparison tool for analyzing byte-by-byte differences between two files. Use the Histogram tool to count byte occurrences and visualize data. Computes Check Sum/Hash Algorithms including CRC-16, CRC-32, Adler32, MD2, MD4, MD5, RIPEMD160, SHA-1, SHA-256, TIGER, etc. 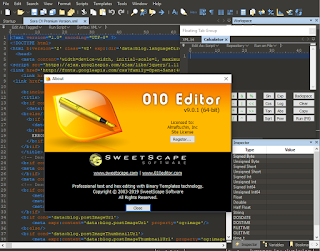 Simple or complex editing operations can be automated using a syntax similar to C/C++. Features over 300 different functions for operating on data. 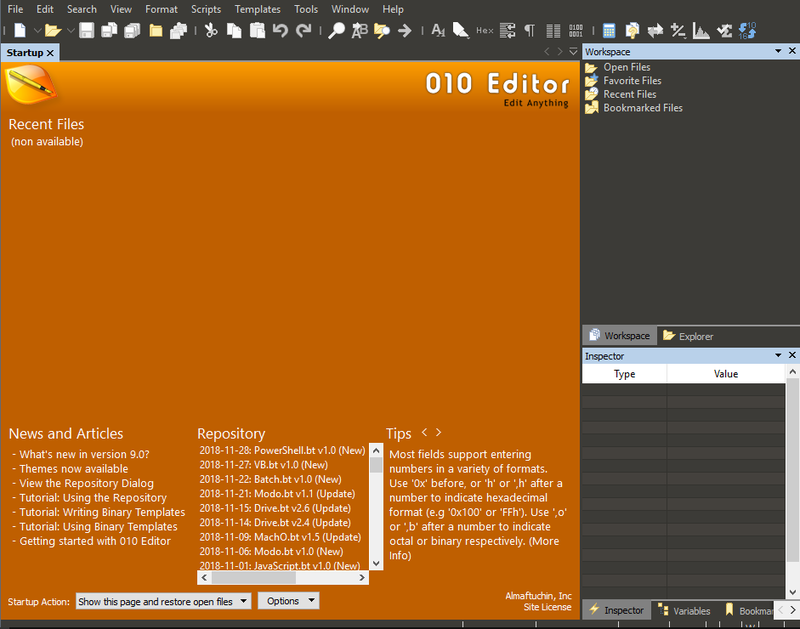 Integrated with Binary Templates to intuitively edit files. Simply assign to variables defined in a Binary Template to modify a file. Scripts may be shared and a list of scripts for download is available in our Script Archive. Run scripts from the command line with no user interface for batch processing. 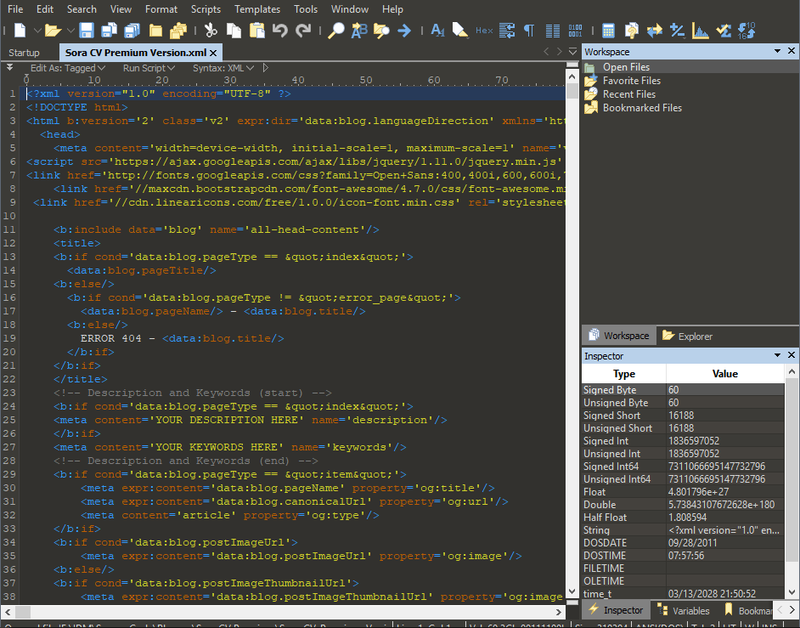 Powerful Workspace view including file explorer. Convert data between ASCII, EBCDIC, Unicode, UTF-8, etc. Inspector allows data to be quickly interpreted in different formats. Mark important bytes using Bookmarks. Apply Highlighting rules to identify bytes in a file. Import or export data in Intel Hex Format, Motorola S-Records, Hex Text, C/C++/Java Code, Base64, Uuencoding, RTF, or HTML. Printing with full print preview, headers, footers, and margins.